Yes, that really is right! 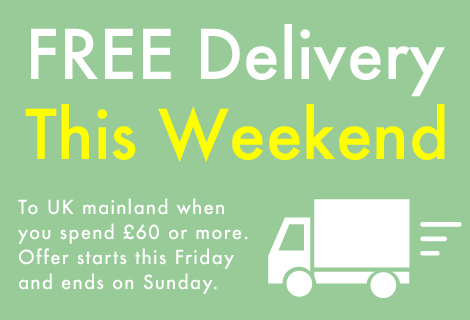 Spend £60 pounds or more online this weekend at at Japancentre.com and get free delivery to anywhere in the UK mainland. This offer will only last a few days so now is a great time to stock up on all those kitchen cupboard essentials like rice, soy sauce, cooking sake and Japanese snacks. Read on for the full conditions of this great offer! • This offer is only valid for orders received from 00:00AM Friday 11th March to 11:59PM Sunday 13th March. • Only orders with over £60 of items in the basket are eligible for free delivery. Packaging fees are not considered part of this £60 total. • Free delivery is only offered for 1 box up to 30kg. This 30kg is inclusive of packaging weight. • All free deliveries will be delivered by courier and arrive with you the following working day after dispatch. Chilled item orders are guaranteed to arrive before 12PM. • All order are subject to a £1 (plus VAT if applicable) packing charge to cover the cost of the box and packaging materials. • Any orders with chilled items are subject to £1 (plus VAT if applicable) packing charge and and additional £1.70 (plus VAT if applicable) to cover the costs of a polystyrene box and chilled gel packs. • Please note that the delivery charge will still be displayed during the checkout stage, but we will remove the delivery cost before taking the payment. • This offer only covers the UK mainland. Mainland addresses exclude Scottish Highlands, Northern Island and the Channel Islands. Yes, of course, all orders over £60 will automatically have the postage removed before we take the payment. We do not charge your card until we dispatch the items so we will make sure that you do not get charged for the postage.